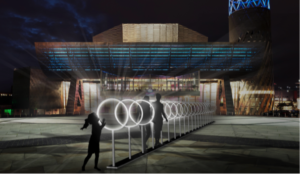 Quays Culture, pioneers of digital arts and cultural events, is commissioning two new major digital artworks at the 2018 Lightwaves; the UK’s only FREE digital light festival. Hooded Youth is a towering, hooded sculpture created by Stanza which captures visitor data, using mini screens and light illumination built into the creation. The tall figure’s hoodie challenges our assumptions about social alienation and anti-social behavior, and is presented as a symbol of belonging. Digitally interactive, the artwork encourages engagement with its technological system, which feeds in intelligence so that it becomes a symbolic memory bank of place and experience. Audiences interact by sending messages to the hooded creation; which is then portrayed as illuminated news streams, through the wire works with graffiti and poetics. Spectrum from Montreal-based collaborative, HUB is a commission with Quartier des Spectacles Partnership. The idea is to engage with the installation by activating hoops. The technology allows for visitors’ sounds of words to travel through a system of delays, and as they flow they trigger light displays that travel at the same speed of these sounds, creating a fascinating illuminated display of the movement of sound. The artwork illuminates how we communicate, and how we decode data with multiple sensors. 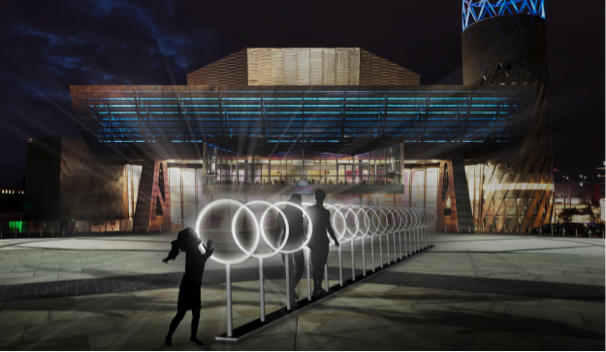 Lightwaves 2018 will be showcasing 16 innovative displays, illuminating Salford Quays from Friday 7 December until Sunday 16th December 2018.